Google acquired another startup in texting and virtual assistant segment. 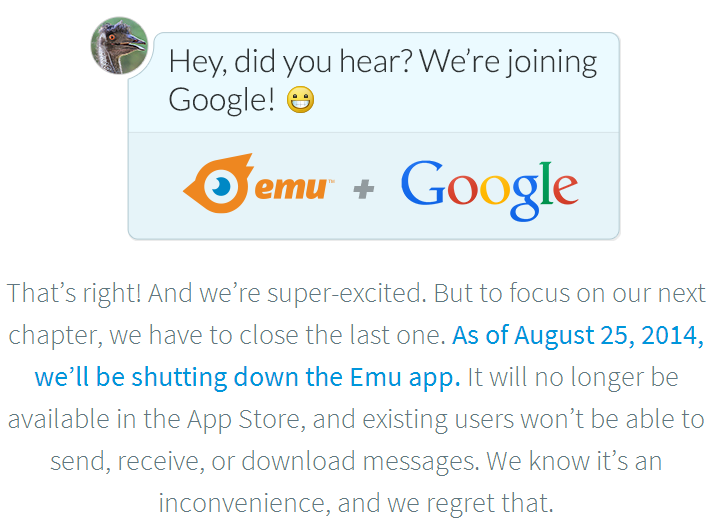 The text-messaging app is Emu. This deal was done with an undisclosed amount to boost up Android messaging, Google Now or Hangouts and some other Google messaging services. Emu comes with a built-in virtual assistant and its ready to shut down on August 25 as its team of developers heads to Google’s Mountain View offices. It means the iOS app will no longer be available in the App Store and existing users will no longer be able to send, receive, or download messages. The post also added “We know it’s an inconvenience, and we regret that”. Emu uses artificial intelligence which is basically machine learning and natural language processing to understand messages. It includes relevant information to help the user plan a lunch date, reserve a table, buy movie tickets, or share their location in real time. Emu started its journey in 2012 by tech veterans Gummi Hafsteinsson and Dave Feldman. Hafsteinsso is the former vice-president of product for Apple’s Siri and was also senior product manager at Google. Feldman was instrumental in the design of Yahoo Messenger for Windows and for the iPhone. He also worked at AOL for sometime. EMU received funding of $1.5 million from Kleiner Perkins, TriplePoint Capital, Menlo Ventures, DFJ, and additional angel investors. Lets see how Google makes EMU interesting to Android users.